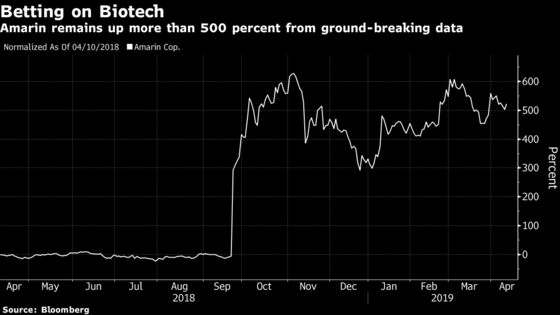 (Bloomberg) -- Investors slowly raised bets against small-cap drugmaker Amarin Corp. as speculation around a possible deal has calmed in recent weeks. Shares have maintained their gains after the company submitted a filing to U.S. regulators at the end of March to broaden the indication for its heart capsules. There are more than 21.7 million shares of the Dublin-based company sold short, up from the approximately 12 million short in mid-September, according to financial analytics firm S3 Partners. The stock surged later that month when its fish-oil-based medication showed promise in a long-term study. Short selling increased over the last three weeks as speculation of a multibillion-dollar deal quieted and investors shifted their focus to first-quarter prescription numbers. Roughly 6.6 percent of Amarin shares available for trading are sold short, the highest in more than a year, with 2.1 days to cover, according to data compiled by S3. The company’s American depositary receipts remain more than 500 percent higher since the initial “Reduce-It” trial announcement on September 24, bringing its market value to about $6.3 billion. One thing is clear. Amarin options appear to be maintaining the bullish theme with total call open interest exceeding put open interest by more than 3 to 1. Over 33 percent of those calls are set to expire on April 18 and the at-the-money straddle is expecting a 5 percent move in shares between today and expiration. Those option bets could be used by investors as a hedge against shorts. A key catalyst for the drugmaker will come in the few weeks, when management reports first-quarter results. Amarin expects revenue to increase more than 50 percent to about $350 million in 2019, driven by sales of Vascepa. The average analyst estimate calls for 2019 revenue to reach $365.5 million, data compiled by Bloomberg show. Wall Street analysts have pounded the table for a larger company to make an offer for Amarin and help accelerate uptake of its potential blockbuster. The company on March 28 said it submitted a supplemental filing to the Food and Drug Administration for Vascepa to reduce the risk of major adverse cardiovascular events, the same week as the drug won a notable endorsement from the American Diabetes Association.